As I’ve been using a slow n sear in my kettles for about four years and know what to expect from it, I’ve decided to do my first few cooks in the new grill in a traditional set up. 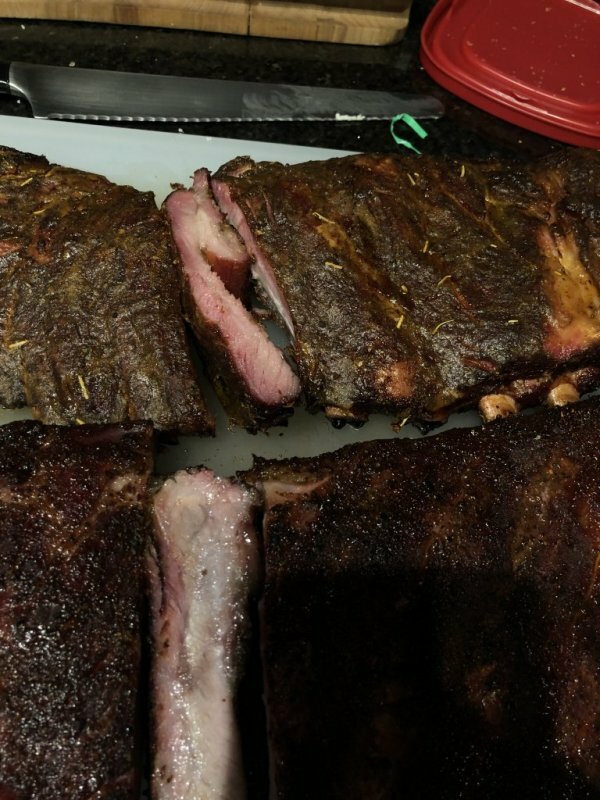 I cooked two racks of spare ribs at 225 with a water pan under the heat deflector. This provides some serious steam. 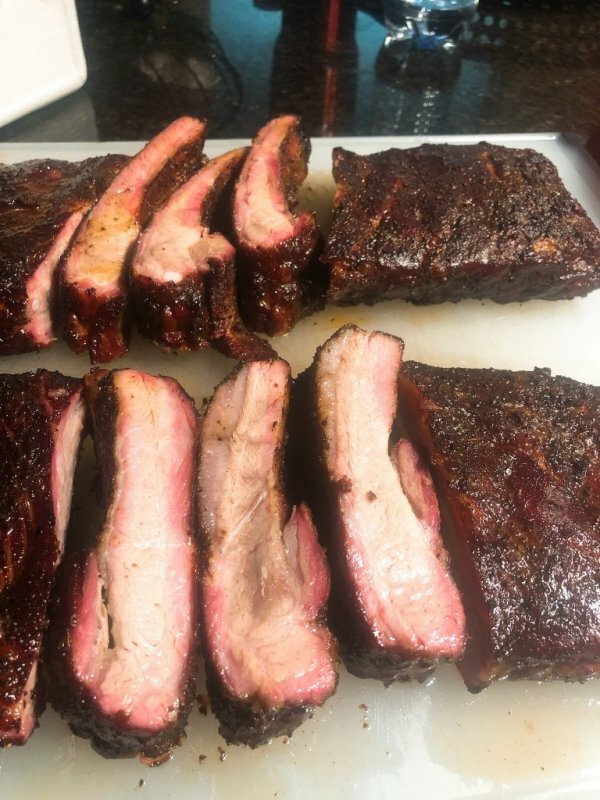 The ribs cooked for 6.5 hours. 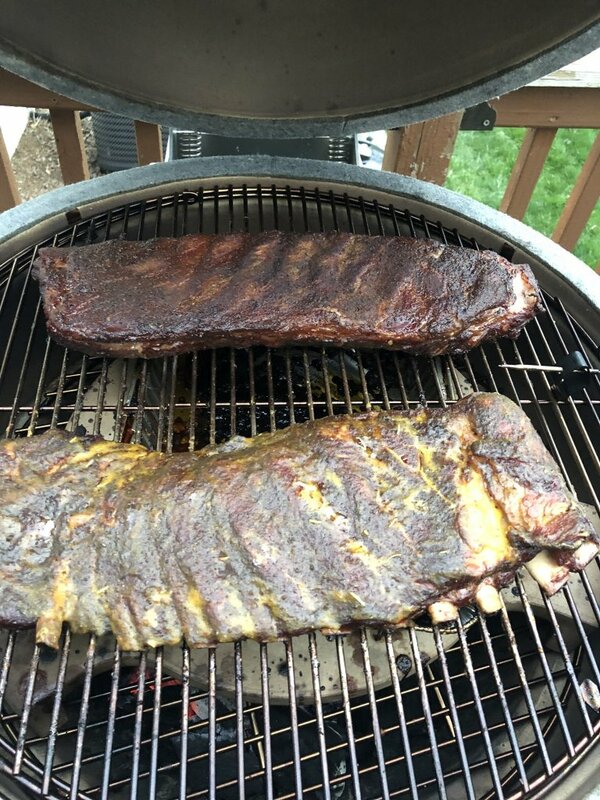 I rubbed one rack with Dizzy Pig Swamp Venom and the other rack with Meathead’s Memphis Dust. I also employed a mustard based bbq sauce on one of the racks. 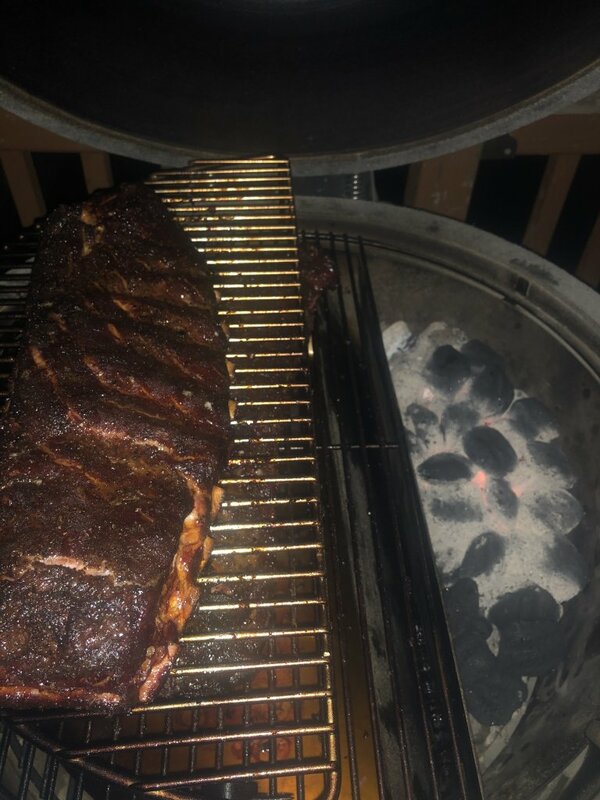 How do you like this Kamado? I’ve only done one cook it it so far. But the inaugural run was fantastic. It’s a great value, it’s 22 inches and comes with ALOT of accessories. With a water pan under the deflector I can imagine lots of steam would be produced. I have never tried this. Forgive me if this a stupid question, but what does the steam do for the cook? Retain moisture in the meat? The steam helps with smoke adhesion. Smoke sticks to moist surfaces. Read this excellent article for more details. In the original slow n sear I did have slight warpage in the water trough. It didn’t effect the performance at all. In the slow n sear 2.0 ( the version that comes with the kamado) I have experienced no warpage after a year of hard use. I cook 4-5 times a week year round. I’m no engineer, so I may be wrong about the why but I believe it’s because the water trough in this version is removable and not actually part of the unit. Nice. 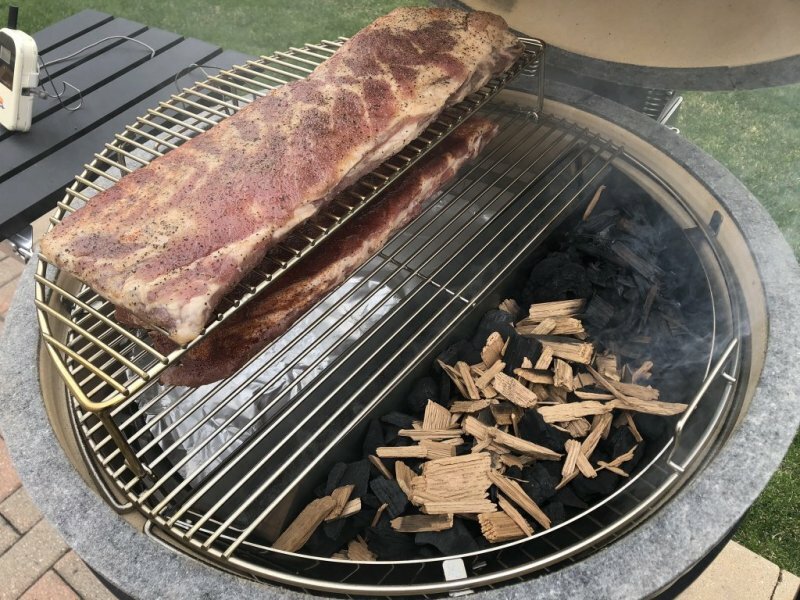 I'm making a couple racks of spare ribs on my SNS Kamado right now (my first cook on it too) using the SNS indirect method. Looking and smelling good so far. 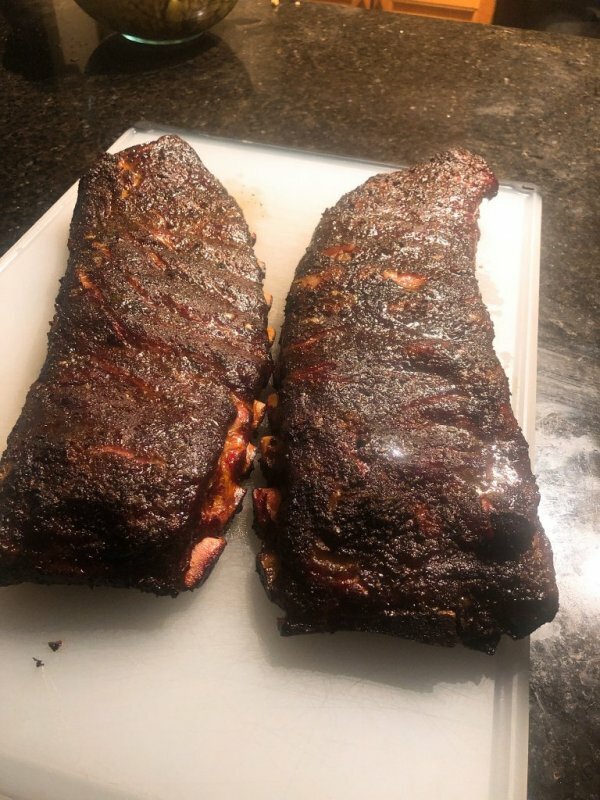 Cooked St. Louis style rubs again, only this time I set up with the Slow n Sear. 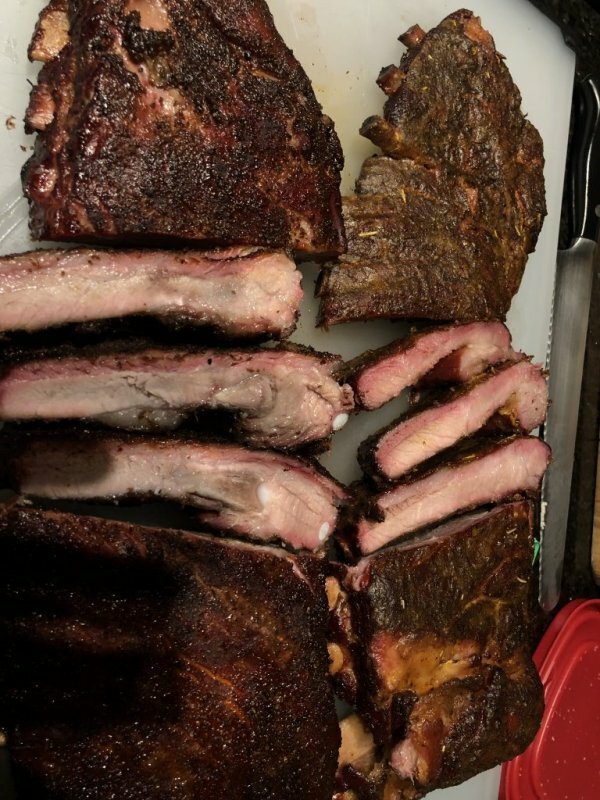 I got an even better smoke ring, better bark and more Smokey flavor as well.